Pharm. Emeka Duru (left), National Secretary, Pharmaceutical Society of Nigeria; Pharm. Ifeanyi Atueyi,Publisher Pharmanews, Pharm. Ahmed Yakasai, President, Pharmaceutical Society of Nigeria and Dr. Francis Adedayo, President, Nigeria Medical Association(NMA) during the NMA courtesy visit of the Pharmacy house, recently to end the interprofessional rivalry in the health sector. To ensure quality healthcare delivery in the country, leaders of the Nigerian Medical Association (NMA) and the Pharmaceutical Society of Nigeria (PSN) have resolved to put an end to the conflict between both organisations and to work together. 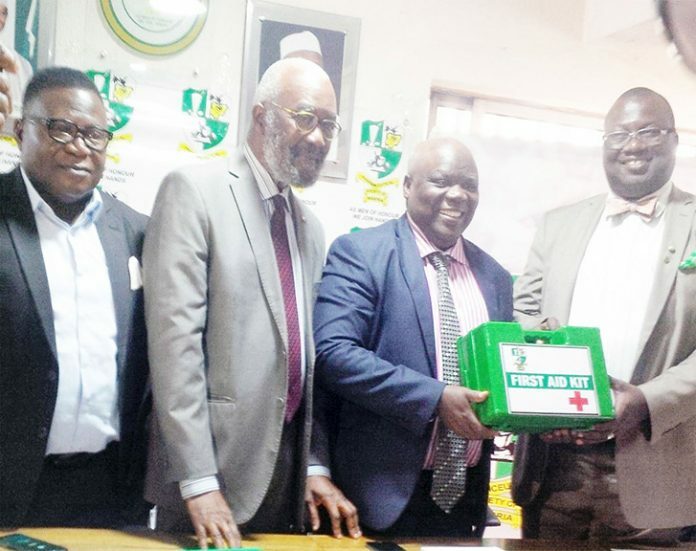 The bodies made this decision when Dr. Francis Faduyile, the President, Nigerian Medical Association (NMA), led his executive members on a courtesy visit to the PSN headquarters in Lagos, recently. During the meeting, Faduyile, pledged to work “harmoniously” with the PSN President, Ahmed Yakasi, foster development in the health sector. He said, “The health system in Nigeria cannot move forward if we continue to work in disharmony. It is important for the leaders of both parties to look inwards and plan for the benefit of the patients. Faduyile noted that the issues between the two parties had shifted focus from the challenges facing the sector, especially in the area of allocation of funds and the issue of specialisation. “The Federal Government promised a minimum of 15 per cent to fund the health sector, but we have received only 3.8 per cent this year,” he added. In the area of specialisation, Faduyile urged both parties to come together to discuss the introduction of PharmD and consultant pharmacist, which seems to enable pharmacists perform some roles designated to doctors. “The National Health Insurance Scheme is a platform that we could use to straighten issues in health institutions in the country. If we work harmoniously, both pharmacists and doctors can get the best out of their trade,” he said. On his part, Pharm. Ahmed Yakasai, President, Pharmaceutical Society of Nigeria (PSN) attributed the current brain drain of healthcare professionals to the rivalry between the dominant unions in the country, leading to over 8,000 Nigerian pharmacists practising in the United Kingdom alone. Yakasai lamented the obvious fragmentation in the nation’s health care system, insisting that the health sector could not make any meaningful progress without inter-professional collaboration. Yakasai added that the rivalry denied patients the requisite care which doctors and pharmacists and other healthcare providers had sworn to give. Yakasai and Faduyile, then decided to work with the PSN President, Ahmed Yakasi, foster development in the health sector. Both therefore, resolved to set up committees to iron out issues responsible for the rivalry and explore ways of resolving them. The two leaders also resolved to prevail on their respective unions to withdraw all court cases involving doctors and pharmacists and other bodies to pave way for harmonious settlement of all issues. Some pharmacists and doctors that attended the parley including Kingsley Amibor, the National Chairman, AHAPN, and Duru Emeka, the National Secretary of the PSN. On his part, Pharm. (Sir) Ifeanyi Atueyi, chairman, PSN Interprofessional Committee said he is happy that the NMA leadership is keen to work with other health workers to ensure harmony in the health sector. Pharm. Atueyi noted that health professionals must embrace the new trend in healthcare delivery globally because it is a positive development, adding that better understanding of current realities in healthcare delivery, especially the changing roles of other health workers will help in resolving most of the issues in contention.